Grimoire's combat can boast plenty of complexity too. Even though on the surface, most fights will consist of you telling your characters to attack and then holding the Enter key to skip turns, a lot of systems will be interacting under the hood while you're doing it. Your characters' stats, skills and damage types all play a part when determining how successful their attacks are. But then, even though you can't control it, those attacks can target different body parts with their own armor values. And on top of that, your characters can cast spells, use items, hide in shadows, and so on. All this leads to a combat system that seems simplistic but actually isn't. However, initially you may not notice any of this because the game's UI is far from intuitive and feels extremely clunky. My biggest advice there is to try and click everything with both the left and right mouse buttons. Doing so will let you discover plenty of UI functions that are easy to miss. With them in your arsenal, in time, the game's controls will start feeling natural and easy to navigate. Another thing to note about Grimoire's combat is that you can't see monsters, or NPCs for that matter, until you bump into them on the map. This counts for both static and random encounters. But at the very least, you can cast a spell that lets you know where the enemies are hiding. This helps because, while generally the game offers a nice level of challenge that keeps you on your toes, some of its monsters can feel extremely cheap and annoying. Enemy placement was also something I didn't particularly enjoy. It almost felt random, where in some late game areas you would find enemies that didn't offer any resistance, and oftentimes the amount of experience you got for slaying monsters seemingly had no connection with how hard or easy the encounter was. And in general, divining how some of Grimoire's systems worked, felt like an epic quest in itself. The game's detailed manual can definitely help you there, but having finished my playthrough before the manual was released, I have to say, there's something inherently satisfying in figuring out how a game works. Experimenting, failing, trying again, not being sure about anything – there's a certain long-forgotten charm there. Beating a game. This expression doesn't hold a lot of meaning these days. Even the tough and challenging games are usually fairly straightforward and follow the same widely accepted tenets of game design. They exist to provide you with fun. Grimoire isn't like that. It doesn't want to be beaten. It challenges you to use your brain, and it's very good at doing so. And while this can make the game feel quite inelegant at times, it's what makes it such a great adventure. You never know what to expect, how things work, what mysteries, foes or horrors await you around the corner, and what bits and pieces of information you may need later. 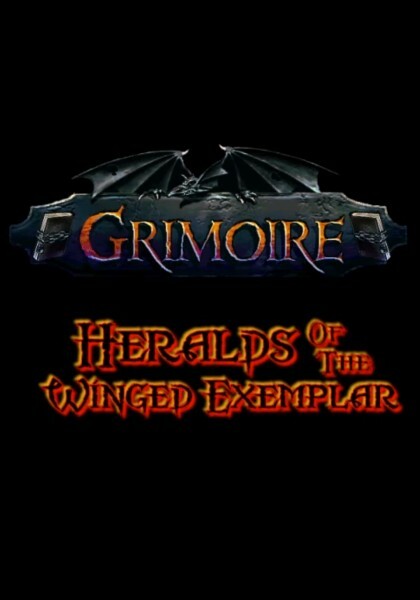 Because of that, Grimoire is a game that's best played in parallel with other people. Forget about spoilers, find some friends in real life or online, and play the game together. Share tips, discuss your experiences and pool your collective knowledge – this should greatly improve your enjoyment of the game, especially considering that after a certain point it opens up and lets you tackle its content in whichever order you choose. The game's story revolves around a magic owl that keeps the world going by winding up a special clock every thousand years. Occasionally the owl needs some help and as its heralds, your party of adventurers will need to find a number of special tablets hidden all over Hyperborea and then figure out what to do with them. On your journey, you'll visit old tombs, ancient cave systems, ominous temples, and several bustling settlements. You will deal with spider vampires, tree spirits, minor gods, and will even get a chance to travel through time. And while you're exploring Hyperborea, the story is presented to you through a series of observations, descriptions, notes, and conversations. You will have to piece it all together yourself. As a result, you don't get a clear picture of what's going on for a good while, and even then you can easily miss plenty of details. Many of the game's events and locations are interconnected in a variety of clever ways, and so figuring out what's going on can be quite fun.